For nearly a decade, food co-ops have advocated for national, mandatory labeling of foods produced with genetic engineering (commonly called GMOs). We have called for a clear, simple label that can tell people at a glance if a product contains ingredients that were produced using genetic engineering. Our motivation has always been simple: we believe that people have a right to know what’s in their food. A strong grassroots effort that included the voices of many co-op shoppers and staff succeeded in raising the call for GMO labeling to the attention of Congress. In 2016, Congress passed the National Bioengineered Food Disclosure Standard, a law that requires labeling of genetically engineered (“bioengineered”) foods. Accordingly, the U.S. Department of Agriculture (USDA) developed and released labeling requirements in late 2018 that offer food companies several options for disclosing the presence of genetically modified materials in their products. Although companies have until January 1, 2022 to label qualifying products, you’ll probably start to see products with genetically engineered ingredients labeled well before then. While we feel that transparency of genetically modified foods has been generally improved, learning more about labeling requirements and what you’ll see on packages can help you make informed choices. Despite widespread familiarity with the terms GMO and genetically engineered, the new labels will exclusively use the term bioengineered to refer to food that contains genetically modified DNA. In fact, companies are prohibited from using the terms GMO, genetically modified and genetically engineered to describe products that do contain genetically modified material on the label. Products that do not contain genetically modified material (such as those verified by the Non-GMO Project) will be allowed to continue to use the term Non-GMO in labeling. Despite the potential for confusion, USDA offers food companies several different ways to legally label bioengineered foods, to be determined at the company’s discretion. The most direct option companies can choose is to provide a written disclosure on the ingredient panel that says bioengineered food, or contains a bioengineered food ingredient. Companies may instead choose to disclose using a symbol designed by USDA that reads BIOENGINEERED. Companies can choose to include a QR code on the package that will lead to a written bioengineered food disclosure when a customer scans it. One of the least transparent options, a serious drawback of this method is that it is unfair to shoppers who do not have a smartphone and/or reliable internet access to view the bioengineered food disclosure online. In certain circumstances, companies could also use text messages, phone numbers or web addresses to provide a bioengineered disclosure. Which foods are required to be labeled? Most (but not all) foods containing detectable amounts of genetically modified materials must be labeled. For example, cereal made with GMO corn must be labeled. It may surprise you to know that highly refined oils and sugars, like those extracted from corn, soybeans and sugar beets, lose so much of their unique DNA during processing that it is no longer detectable by currently available tests. Foods made with these extremely common ingredients, even though they may have been derived from bioengineered crops, are not required to be labeled unless there is other detectable bioengineered DNA in the product. Companies may voluntarily choose to disclose these processed ingredients using the options listed above, with the language “derived from bioengineering” (see example shown). Products like milk, cheese, ice cream, eggs and meats that come from animals fed a diet that includes bioengineered feed like corn, alfalfa and soy are not subject to labeling. To make matters even more confusing, companies are actually prohibited from disclosing GMOs in any multi-ingredient food that has beef, poultry, catfish or eggs as a top ingredient, even if they contain other GMO ingredients. This means that if the same GMO corn used in the cereal example above is also an ingredient in beef soup, the cereal manufacturer must disclose the GMO corn, but the beef soup manufacturer cannot disclose the GMO corn to you. Because this exemption is complex, you might want to read up on it here. Although the exemptions in this rule mean that these labels do not achieve the level of transparency food co-ops and consumer rights groups had hoped for, we take heart in the fact that many companies have heard from their customers and food co-ops when it comes to this issue. Consumer research continues to demonstrate that people expect and appreciate transparency about where, how and from what their food is made. The trend is for companies to become increasingly forthcoming about these matters. Companies that champion their customers’ right to know how their food was produced will likely choose the on-package written disclosure or symbol, and use USDA’s voluntary labels to the extent allowed by law, even if their product is exempt. For products where disclosure is prohibited by law, some companies may even join consumer groups to legally challenge those exemptions. Although the bioengineered food labels fall short of the transparency that many shoppers want—there is still a popular food label that provides transparency in production—USDA organic certification. Organic food, by law, cannot be produced from GMO plants or animals, making it a meaningful way for people to know how their food was produced and what’s in it. Food co-ops will continue to work within our supply chain to encourage transparent and straightforward labeling. 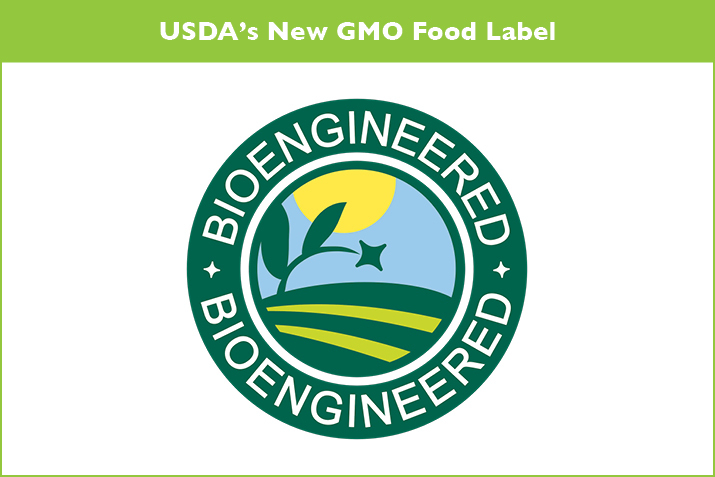 If you have further questions, check out USDA’s answers to frequently asked questions about bioengineered labeling requirements.